I have been doing a lot of thinking lately, about who I am as a person and what is important to me. Maybe it is about family, maybe it is about the perspective gained from a number of years at a couple of wonderful careers. Maybe it is the mighty struggle to survive as a small business in a tough economy. Maybe it is a little bit of everything that shapes a man and makes him who he is. Whatever it is, it is. I know this about myself - that my family, my town and my business(es) are what define me. If you know me personally, you would probably describe me as a fanatical workaholic, saying something like you don't know anybody who works harder than I do, or that I am one of the hardest working people you have ever met, or something along those lines. I can't say that I am terribly proud of being seen that way, because it is not only a sign of strength, but it is a sign of weakness all the same. To be so dedicated to work, to try so hard to make a good life for your family and for yourself, is a sharp knife. You find yourself in a horrible Catch-22. The harder you work to provide for those you love, the more you hurt them by not having quality time with them. And to be a workaholic means at its core that you don't really know how to break that cycle, because your view of success involves doing well in business, which means taking care of your family, which means working harder, which means having less time to spend with them, which means disappointment, which leads to trying to do better at work, which leads to less time.. you get the idea of the vicious cycle. There are many clichés about this workaholic phenomenon that I am the poster boy for. And as I said, whether it is good, bad or indifferent, I am the hardest working person I know, and I am proud of it. I work hard, I always try to work smart, and I don't always succeed, but I have a brutal survival instinct that you will rarely find. I have a light that nobody can put out - an optimism that comes from simply assuming that I am strong enough and tough enough and smart enough to make it happen no matter how bad it gets. Whether it ends up being true or not really depends on whether I am still standing or not, right? So I judge myself to be strong, tough, and smart for as long as I am not dead, or living in a cardboard box under a bridge on 8 Mile. Indomitable Spirit, whatever you want to call it. I give credit to my mom and dad for instilling this quality within me. They believed in me, they supported me, they made me believe that I could do anything I set my mind to doing. I hope they are proud of me. I love them. So why am I telling you this, and what does it have to do with Detroit? Well, I was born in Lake Worth, Florida and grew up in Miami. In a past life I made a nice career for myself, nine years with an automotive aftermarket performance parts retailer. With Super Shops, I moved from Miami to Fort Lauderdale, Fort Lauderdale to Tampa, Tampa to Atlanta Georgia, Atlanta to Memphis Tennessee, Memphis to Cleveland Ohio, Cleveland to Detroit as my career went up the corporate ladder over those nine years. Then in 1994 I had a son and grew roots in Detroit. I started my own business. I had another son, then two daughters. I have been doing what I do in that business for the last 17-18 years or so. And now I feel like I am an official Detroit transplant. Detroit. I have such love for Detroit, because of the spirit and the people. It seems that no matter how bad it gets, no matter what goes wrong, you can't kill the spirit. That is who I am too. I completely identify with the hard scrabble reality of the city. Like me, there are points of beauty and finesse and class and technology. Like me, there are shocking weaknesses, ugly parts, awful examples of waste and neglect and inability. And they are a confusing mix, a total anomaly, a shining example of an enigma. Just like me. How can anybody not be in love with Detroit? The Lions, The Tigers, the Red Wings, The Pistons. Best Sports Town in the USA. The architecture, the history, the music of Motown, Kid Rock, Uncle Kracker, Eminem, Madonna, The White Stripes, The Romantics, Ted Nugent, the story of the Big Three, of Ford's assembly line, of our World War II role as the Arsenal of Democracy, of our role in anti-slavery with the underground railroad, civil rights, labor law. How the entire city burned to the ground in 1805 (June 11th, 1805) and was totally rebuilt. Our French roots, our shocking decline in the 1970's and 80's and 90's, the metaphor for the country's move away from industrialization. The riots, the crime, the shocking reality. The story is so All-American. Who can possibly not love Detroit, right? Well, that is just how I feel. So what to do? I have a fire in my belly. A desire to do well, to be seen as a success, to be a success. That fire has burned inside me for my whole life. And I know I have done OK so far - 9 years in a career, then 18 years as a business owner who has a business that is still open - that's is better than many others have been able to do. Yet, the fire still burns. It is not enough. I need more. So let me tell you what that looks like to me. I want to be a stakeholder in Detroit somehow. I want to own land and buildings. I want to do something interesting with them. I want to own examples of architectural and historical significance, and save them from the insane, ridiculous wrecking ball that has been swinging so much around here lately. Clapboard wood framed houses and burned out shells should fall, but classic beautiful architecture should survive to be reborn! I want to save a School, a Fire House, a Church, a Police Precinct and a 1920's era Bank. I want to do something truly interesting and appealing and innovative with them, so the world can enjoy them and that my children can be proud of them when I hand them over in my last will and testament some day. I want to do things in Detroit that inspire others to take on similar projects, and see more people embrace instead of criticize this proud city. I want to accomplish something in the spirit of the old school American. I want to stand back and appreciate the hard work and see something almost lost to history, instead returned to good use and maybe glory. I want to make a difference. Can you identify with that fire burning in my belly? I also have an earth-shattering project in Nebraska that I need to do - something that involves an underground Data Center, a defunct Military Missile Base Installation, Detroit and the Cold War. It is a huge project - something nearly everybody would be intrigued with, or at least amused with, or curious about. There is just no way that this project will stay off of TV as a History Channel or Discovery series. It will take some real money - about $2 million. I am looking at how to get the funding needed to get that one going right now. So stay tuned. If you want to get involved, pledge or donate some money. Or talk to me about being a stakeholder with an investment. In July, 2012 I was listening to NPR on 101.9 WDET and heard about the "last chance" Tax Auction Wayne County was having on about 6,000 tax foreclosed properties. Houses were starting at $500, empty lots at $200. I went online and dug in to learn all about it. I decided that this would be a somewhat affordable way for me to try to get involved. So I placed bids on 14 parcels. I was fully expecting to lose on all 14 and win none. To my sincere surprise, I won 8 lots and 2 houses! Make no mistake - this is a big commitment of time and money. I now have to pay property tax on them forever, and keep them clean and mowed forever. In the case of the houses, I either must knock them down or fix them, and soon. But I feel like it is worth it. I want to see this city bounce back. I want to get on the tax rolls and pay my *fair* amount of tax for my property. I want to feel involved and responsible for this. I want to be an example to others. I want this city to grow strong and to solve its problems. On the land I won, I have some ideas. But none of them is a School, a Church, a Fire House, a Bank or a Police Station. So I need to keep going. Well, I need to get my hands on a School, a Church, a Fire House, a Bank and a Police Station (Status Update!.) For very cheap. I did mention that I am a hard scrabble, struggling business with hard times at my doorstep, didn't I? I currently have offers pending on a closed school, and also a closed school in private hands. As of this writing, those details are being discussed. Then I need to stop the bleeding on each building and make them secure from vandals and scrappers. Then I need to hire local talent, and work very hard, and make each of them into something unique, original, worthy of admiration. I am not an island. The reality of my financial situation is that this will only happen if others see the value in my ideas and put up some money, or give me some help, and make it happen. So what do you say? Can you be the one who makes the difference here? I can't fix Detroit. But I can do one project. And then another project. And then another project. Pretty soon, I will have made a difference. And if others do the same thing, pretty soon, there will be no burned out houses left to tear down, and no more piles of trash in the street, and no more rotting, once-glorious commercial buildings. I know this town is full of people who care. Are any of you reading this? When and how will you get involved? And I know, I know. As my friend, or even as my cynical observer, you may be wanting to ask "Hey workaholic, why do you want to take on something like this? Don't you work too hard already?" Are you feeling inspired? Get involved with your time, your money, your social connections, your influence, your materials, your real estate, or some combination. If you want to pick up a broom or a shovel and actually stand beside me, working to save one of these gems, then drop me a line. Most of you could lend a hand with an outside and inside cleanup, and if not, tell me what your special gifts are and I will make sure you gain some personal fulfillment from helping in whatever way you can. I know I will appreciate you for it. The great people of Detroit will too. If you want to show your love for Detroit, Make a donation to my cause here. The money will be used to support my efforts to develop land, buildings and businesses in Detroit. $5, $500, $5000 or $500,000 - it will make a difference! Any amount is OK.
Click this button to donate $40 to the cause. All donations will be acknowledged and honored in your name, if you wish to be recognized. If not, your identity will be protected. Just tell me to keep you anonymous. Come back and check this page out for updates any time. Thanks. We have a project Status Update for you! We have successfully made a Bona Fide offer and have completed our purchase of the old Detroit Police 6th Precinct at 6840 McGraw Street, Detroit MI 48210, also known as 5658 Braden Street, Detroit MI 48210. We now own the building and property and hold the deed, free and clear of any encumbrances. We are very excited! The building is gorgeous - an architectural gem. It is in severe disrepair. Here is a PDF that gets into the details. The property is on the Southwest Corner of McGraw and Braden. An active Fire Station is next door. There is an indoor motor pool where prisoners were taken from cars to cells. Our Data Center will have the server cabinets locked in the Jail Cells for Maximum Security Data Protection. Our plan rehabilitates the property and honors the original architecture. Built in 1930, the 6th Precinct is 26,275 Square Feet and sits on half a City Block. Power and Data will be delivered underground and our build-out makes the property a fortress. A special word of thanks to the operators of http://www.detroiturbex.com, where this property was prominently featured. We will invite them to take pictures that could perhaps lead to a new section on their site - a section showing what people have done with the abandoned building they have documented. Do you want to get involved, or show support? We would be thrilled if you want to get involved or show your support in some way, but make no mistake - we are not here just looking for a handout. This project is close to our heart and it is happening as we speak. We are passionate about succeeding, and any help will just make it happen faster, and better. 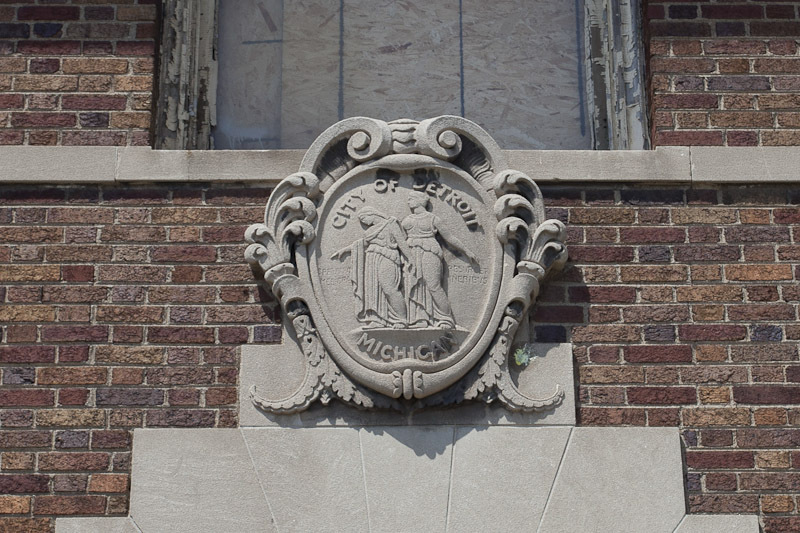 We do need to raise money to start the process of rehabilitating and repurposing one of Detroit's prized pieces of history. We welcome donors, benefactors, partners and/or investors to help fund the securing and cleanup of the interior and exterior. Once the site is secured against further damage, we will begin work on the cleanup and preservation of the interior areas. We have a detailed and comprehensive development plan that leverages our extensive prior experience building and operating World Class Data Centers. This project is worthy of your attention! We are going rescue and repurpose a 1930's era brick building in the heart of Detroit. The building was crafted by true brick and stone masons and is a work of art. It has historical significance with the City in both Military and Law Enforcement circles. I want to breathe new life into it, to preserve it and to make good use of it for now and into the future. Your contribution would help fund the closing up of excess openings in the building with something secure that that honors the original architecture. It would help pay for outside cleanup of the property. It would help pay for new high security doors and would provide for a video and alarm based security system. It would help restore all of the outside of the structure with fixtures, lighting and other repairs required. There is plenty of work to be done. Are you feeling compelled to contribute to our cause? Any funds contributed here will be used exclusively for the redevelopment of this or another depressed, endangered or abandoned property located within the City of Detroit. Your donations will help make a difference in the City of Detroit and you will be properly recognized for your participation, unless you prefer to remain anonymous. Donations made here, while awesome, do not make you a partial owner of the property and do not imply a partnership or a shareholder relationship. If you want to help beyond just a donation and you want to discuss volunteering time, services or equipment, or if you want to talk about becoming a partner or investor, then please contact me! I would love to discuss your ideas.